"Blossom House" Can Be Yours to Rehab for $1.00! 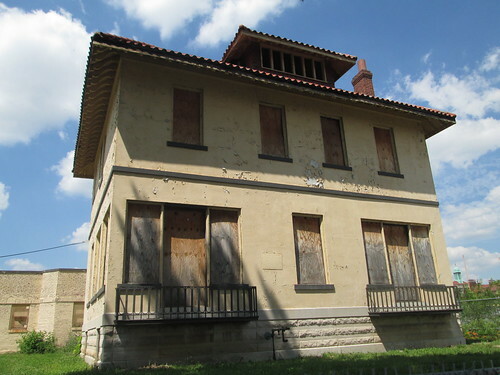 Monday evening the Preservation Board unanimously denied the proposed demolition of the so called "Blossom House" at 5331 Enright, just west of Union. I was unable to attend, but Michael Allen of Preservation Research Office was there to present a couple of National Register nominations. He spoke to the owner who said that they had acquired the house as part of a package of properties that they purchased from the Roberts Brothers that included the historic loft apartments housed in the former Smith Academy and Manual Training School as well as the large chunk of land fronting Enright where the Roberts had planned single family homes (they only built 3 on the site). 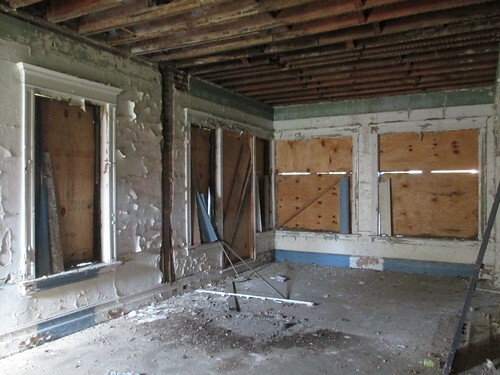 The owner said that they would be willing to sell the Blossom House to anyone willing to rehab it! Like many real estate deals of this nature, Helix likely ended up with the house whether they wanted it or not so they could buy the lofts. If you are interested in this amazing opportunity, please contact Helix Realty at (314) 367-7646. As I mentioned in my previous post, the house has been readied for rehab by having the interior walls taken to stud and the old MEP systems cleared out of the way. This could really be a fantastic house or possibly conversion to a couple of condos or apartments. This is an opportunity that does not happen often. 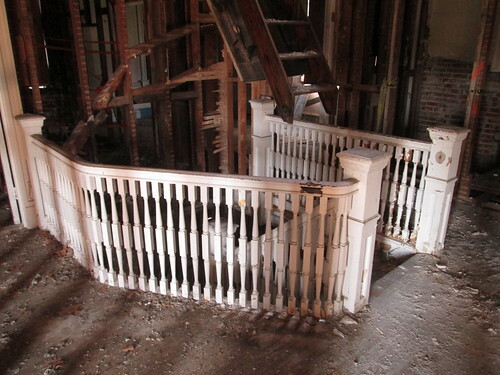 The decorative stair railing at the 2nd floor is in excellent shape. 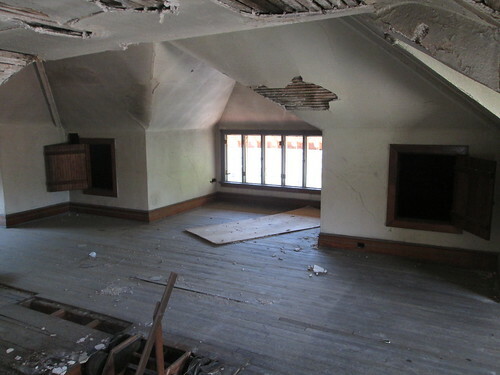 The finished attic over the front of the house is spacious and has a lot of potential. 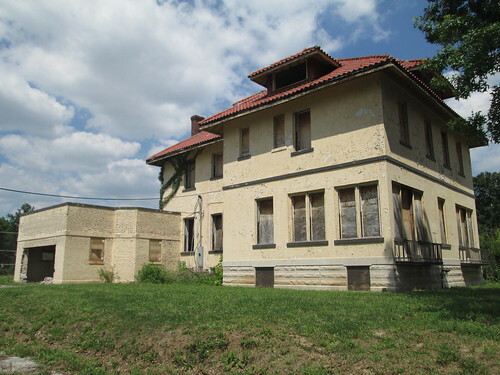 Late last week I looked at the Preservation Board Agenda for this months meeting on next Monday, July 22nd, and was surprised to see an application to demolish a large two and a half story home at 5331 Enright located in the Visitation Park local historic district. Signs on the chain link fence around the house leave no guessing as to the intensions of the owner. The house is owned by Helix Realty, who according to City property records acquired the property in June of this year. According to Helix Realty's website, they own and manage apartments mostly in historic buildings in the Central West End and U-City. They own and manage the Savoy Court apartments, which consists of several historic buildings just south of the house at the northwest corner of Delmar and Union. The home has been known as the Blossom House and was most recently used known as the Blossom House Youth Development Center, a low cost health and dental clinic. The home was occupied at least through October 2005. Photo by Marjie Kennedy. 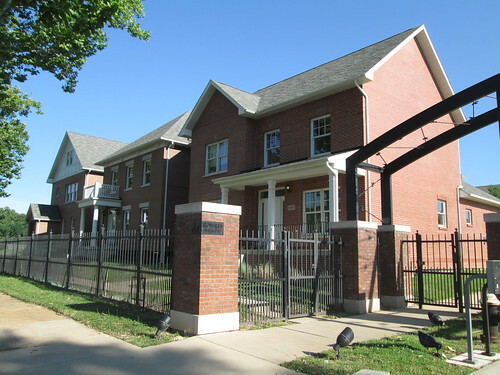 The Roberts brothers acquired the house in 2005 at the same time they purchased the former Smith Academy and Manual Training School buildings from the St. Louis Public Schools. 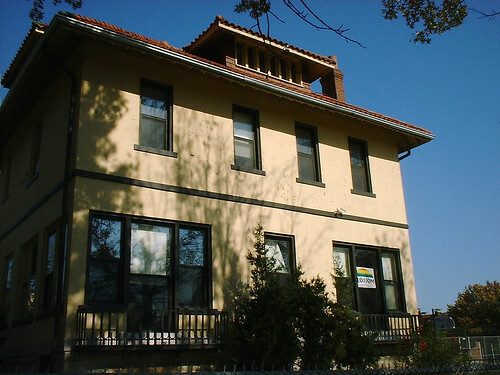 The Roberts transformed the school into loft apartments and planned to rehabilitate the Blossom House as part of a for-sale home development that was to be built along Enright, in front of the former school buildings. The Blossom House is just east of the few of the for-sale homes that were built before the housing market crash. Helix Realty also manages the loft apartments in the former school, but according to City records, the building is still owned by the Roberts. While the house has been vacant for 7-8 years and the windows and gutters were removed, the house is in surprisingly good shape. The missing stucco on the round bay facing east is the only real visibly needed major exterior repair needed (other than windows, gutters & paint). Decoratively cut roof joists are a defining feature at the eaves of the house. A garage was added to the house at some point. 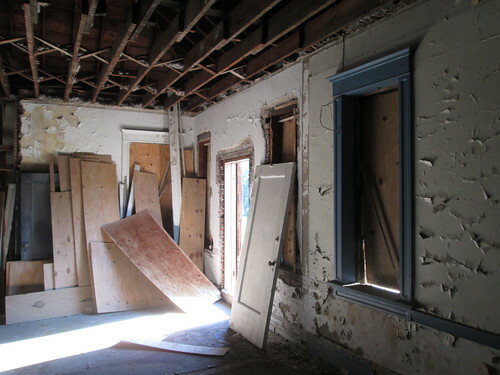 A permit for full rehabilitation of the house was applied for in December 2006, but the only work completed was selective interior demolition. 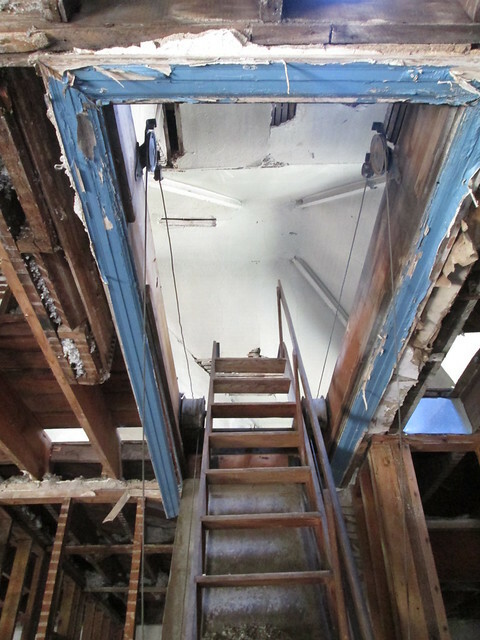 Plaster and lath was removed from interior walls and ceilings and all mechanical, electrical and plumbing was removed. 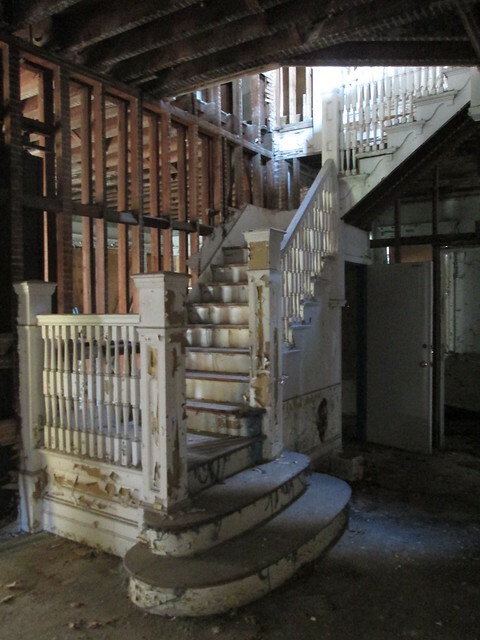 The decorative wood stair is fully intact in the entry hall. 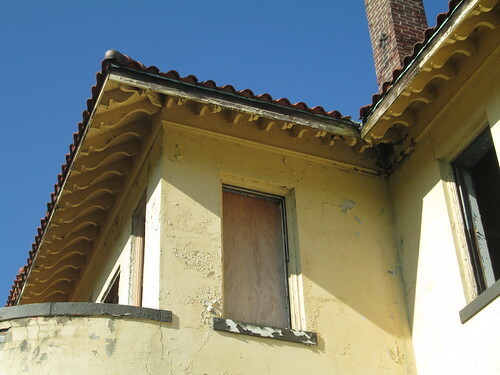 Plaster remains at the exterior walls as well as wood moldings at doors and windows. Most of the floors appear to be 1 1/4" wide oak and while likely need re-finishing, are in good condition. 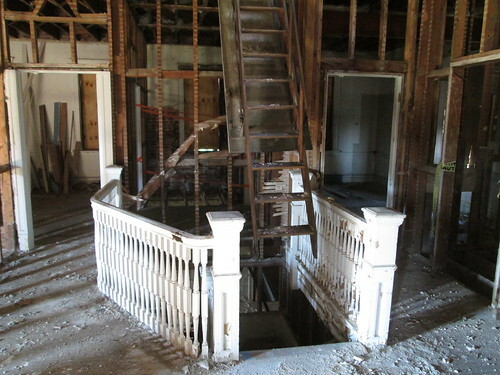 Upstairs, railings are fully intact at the stair. The east bedroom has a door to a balcony over the round bay. For a home that has been vacant for 7-8 years it is in very good condition. The original tile roof must be in pretty good shape because there is surprisingly very little water damage anywhere except some isolated floor damage directly below the roof of the bay. The ceiling of the finished attic is intact and also appeared to be free of the type of water damage that would normally be a big problem for a home like this. Overall the condition of this historic house is very good and there is absolutely NO reason or justification for its demolition. 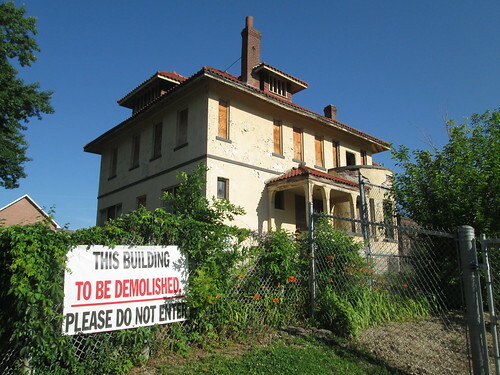 The Preservation Board should deny the application for demolition. 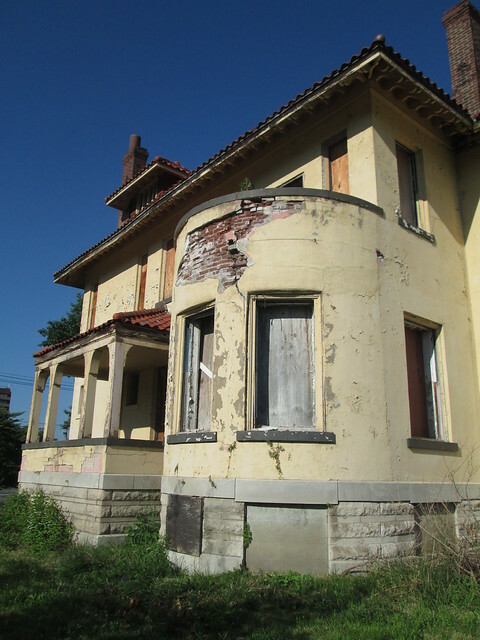 If Helix Realty didn't want to rehab the house, which is eligible for historic tax credits, they should not have bought it last month. 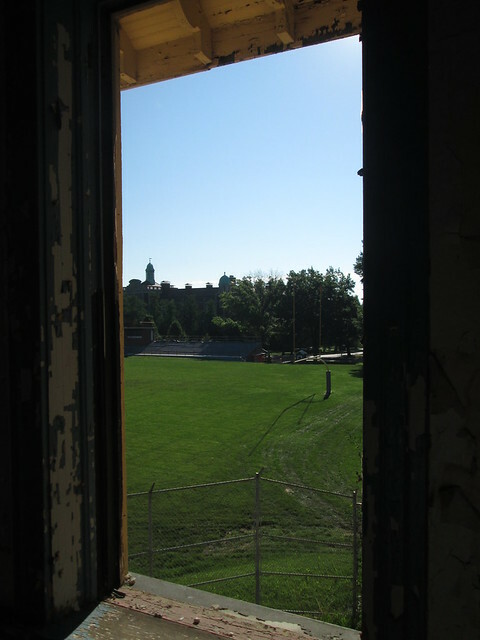 The house sits at the southwest corner of the Public School Stadium grounds and Soldan High School can be seen out this window at the northeast corner of the second floor. City records show that Helix Realty also acquired the stadium grounds at the same time they acquired the house. The strange thing about this is that a permit was granted in April of this year for renovations to the grandstand structure and restrooms there. The work includes replacing all of the brick at the rear wall of the grandstand that faces Union. 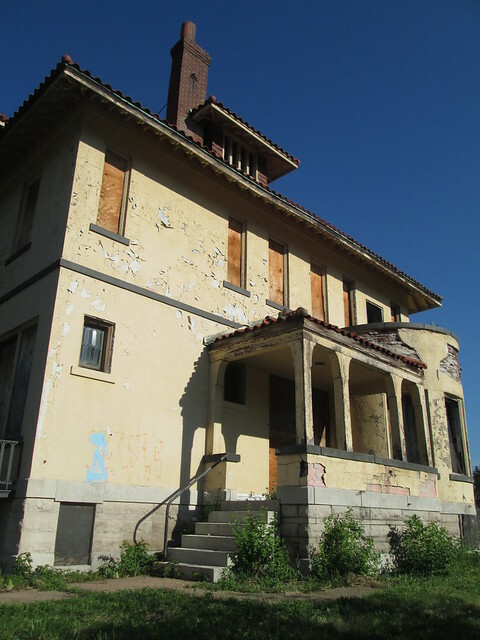 Why would SLPS start this work, which is listed as over $1.1 million then sell the property midway through the work? The date of construction of the home us not readily available as the date listed on the City's property records (1960) is inaccurate. From the style and type of construction I would estimate that it was constructed sometime in the 1910's or 1920's. 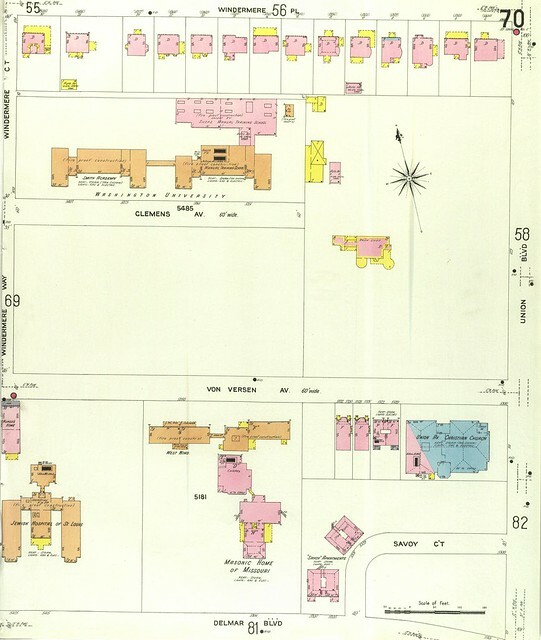 The home does not show up in the 1909 Sanborn map above, but a larger earlier home, which is where the name "Blossom House" is derived, does appear in the center of the property, which was only recently sub-divided when the Robert's bought the home. 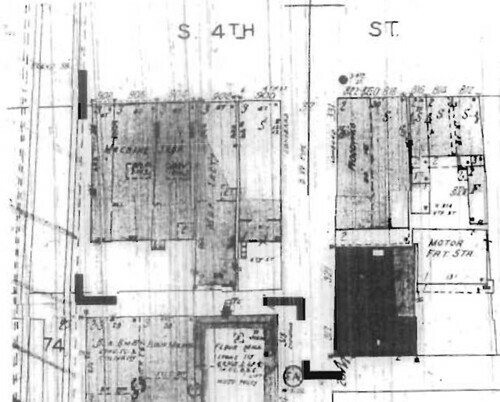 The earlier home was documented in the early 1930's by the Historic American Building Survey. 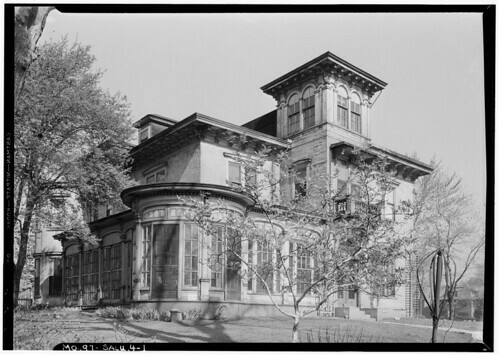 The earlier home was demolished in 1942, probably when it was purchased by St. Louis Public Schools for construction of the stadium. Even in 1942 though, someone saw value in preserving the "newer" home that was not located right in the center of the stadium football field. Significance: Built ca. 1852. Land bought by Professor Jonathan Jones, head of a business college, in 1851. He built six room frame house. Lost all his money in 1861, and property was sold at foreclosure to Chalmer Dwight Blossom, who added large front section to original Jones' house. Blossom occupied the house in 1862. House later occupied by Miss Christine Glass, who operated a pre-kindergarten school there. House demolished 1942. 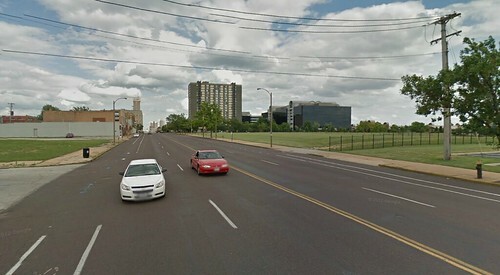 In late may I posted about how the Midwood Hotel in Overland would be demolished if a proposed roundabout proposed by St. Louis County is constructed at the intersection of Midland Blvd., Woodson Rd. & E. Milton Ave. 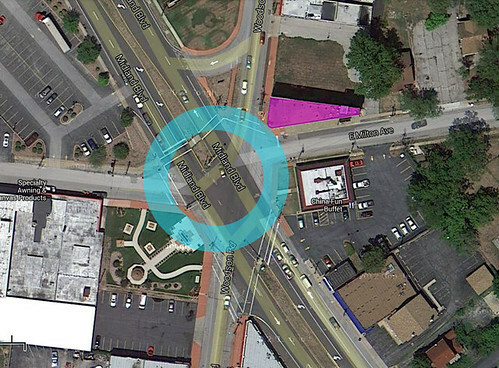 The aerial above is only a conceptual diagram of what a roundabout could look like at this intersection. I have seen no real drawings. The circle is about the size of the pavement at one of the larger roundabouts in the area at Highway 40/64 and Spoede Road in St. Louis County. It is about 180 feet in diameter. The roundabout in Forest Park at the terminus of Hampton is about 130 feet across. More space of course would be needed for sidewalks at this location in downtown Overland. The point of this diagram is that it is very likely that the right-of-way expansion needed for the proposed roundabout would likely only take a small portion of the Midwood Hotel, which I believe may be the tallest building in Overland (except for maybe some church steeples). Why does this matter you may ask? If they need the property, the building gets demolished, right? This has not always been the case, and in fact was once the opposite of the norm. 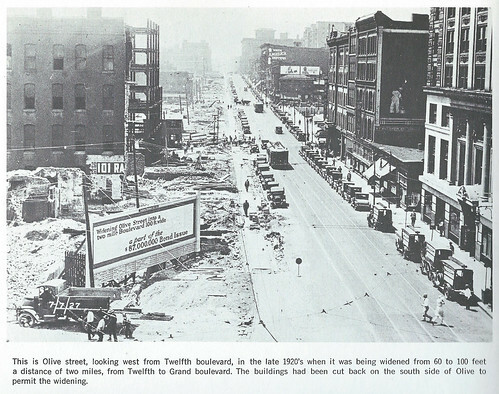 This photo from the book This is Our St. Louis shows the widening of Olive Street in the late 1920's, one of many public projects funded by the $87 million bond issue passed by voters in 1923. While some small buildings were demolished, including the entire block across from the Central Library to make way for the Memorial Plaza, most substantial buildings from Tucker to Grand on the south side of Olive were simply shortened and new facades installed at the front of the structure. 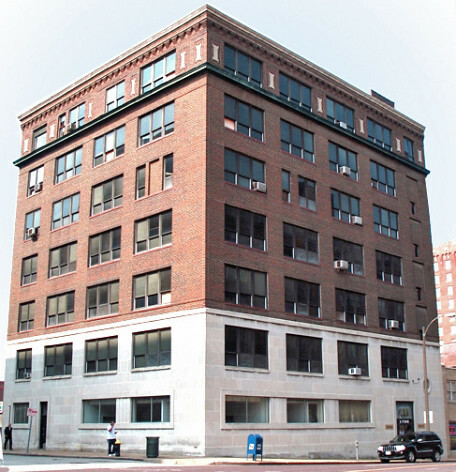 The Henschel Hat Building at 17th, built in 1918 is an example of one a shortened building along Olive Street. 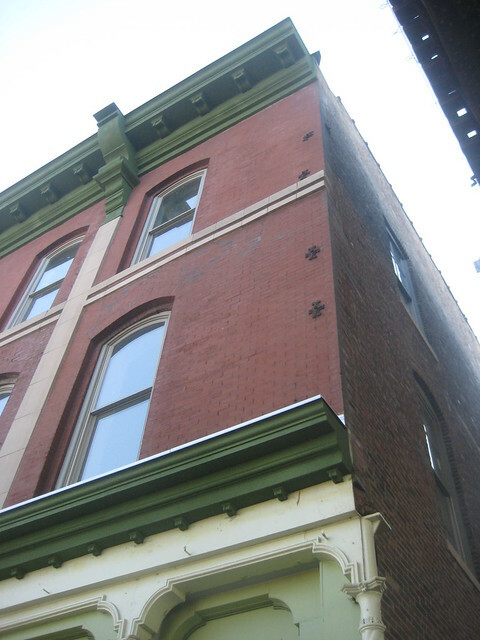 The odd width of masonry at the 17th Street elevation at the corner was the result of the new facade location not matching the original structural bay dimension. With the darker brick color and smaller triple non-arched windows the 1920's facade of this building at 19th & Olive is a bit more obvious as not original to the building. 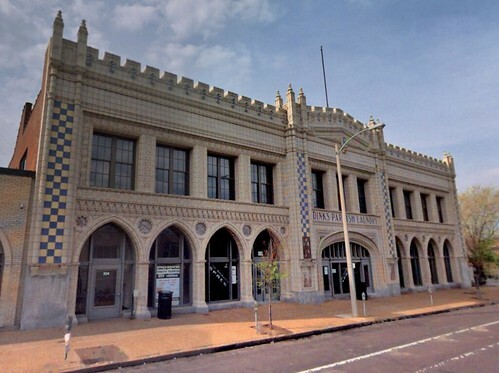 Further west near Compton, the Parrish Laundry Company constructed a highly ornamented terra cotta facade by architect William Levy to unify their original building, opened in 1891 (which was cut back) with an addition to the east in 1926. 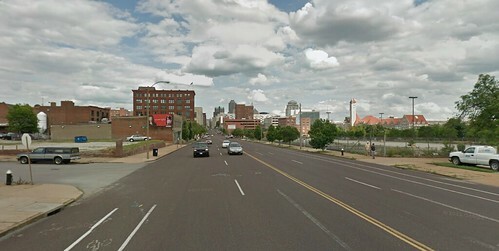 Less than 30 years after the widening of Olive Street, St. Louis would squander it's boulevard dimensions when leaders decided upon wholesale destruction of the Mill Creek Valley area south of the street between 20th Street and Grand. Most of the buildings altered during the widening of Olive Street were demolished and replaced with uses facing inward on super-blocks or simply nothing at all. 54 years after the clearance began in 1959, large swaths of the south side of this 1.36 mile stretch of Olive Street sit vacant and less than a dozen buildings actually front on the right-of-way. 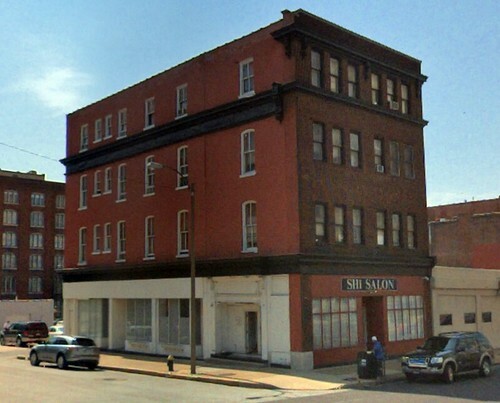 This three story building at 904-908 S. 4th Street is another example of a building that survived an adjacent public infrastructure project. In this case, the right-of-way to construct the approach ramp to the Municipal Bridge (renamed the MacArthur Bridge in 1942), which was built between 1909 an 1917 literally took a slice of the south bay of the building. 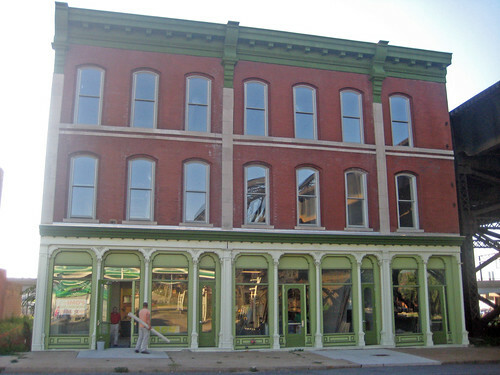 The building, which is located in the South Fourth Street Commercial Historic District had been constructed in 1883 by the Eberle & Keys Undertaking Company. 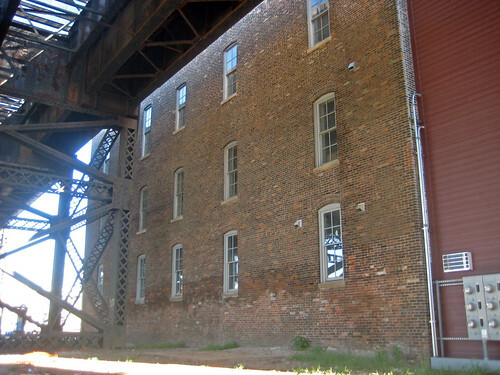 When the bridge came through, instead of demolishing the entire building, or even the entire south bay of the building, the south bay was simply shortened and a new south masonry wall built. 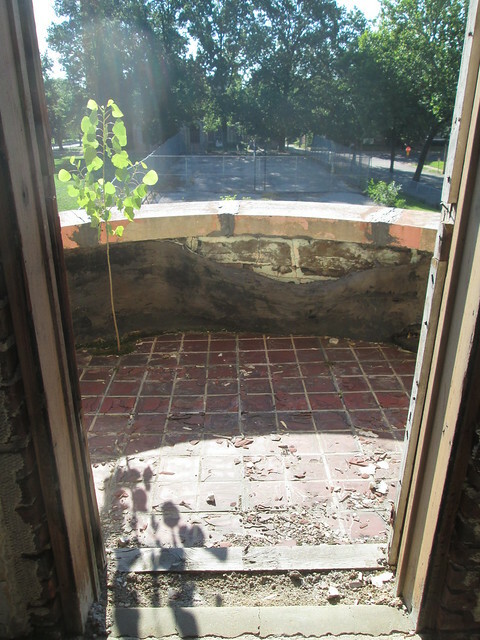 A view of the corner where the building was cut back. The bridge deck above is only about 5 feet from the building. The re-built south wall viewed from under the bridge. 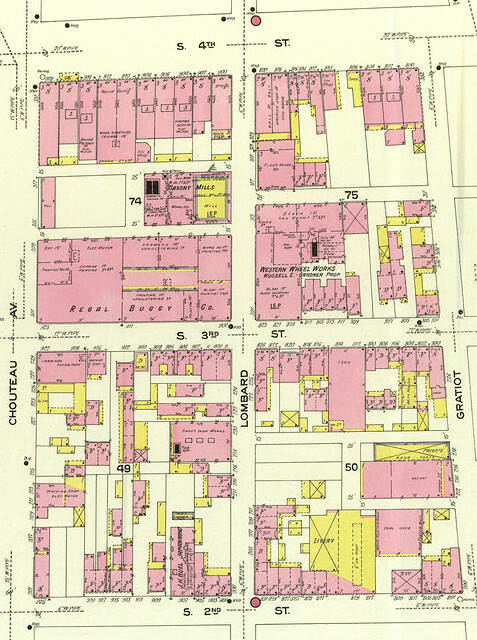 This 1909 Sanborn map shows the block of 4th Street between Lombard and Chouteau fully intact prior to construction of the Municipal Bridge. 904-908 S. 4th is the third building south of Lombard. This 1950 Sanborn shows the 904-908 S. 4th Street building with its narrowed south bay. 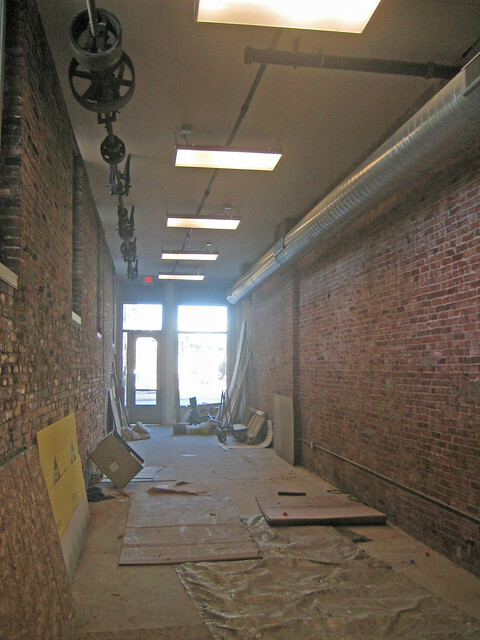 The interior of the narrowed south bay of the building is narrow (about 12 feet), but still very usable for a commercial tenant looking for a smaller space. The building was fully renovated in 2010 using Missouri and Federal Historic Tax Credits to be leased for retail and office uses. Instead of total demolition, the same type of treatment of the right-of-way expansion could be implemented at the Midwood Hotel if the roundabout moves forward. 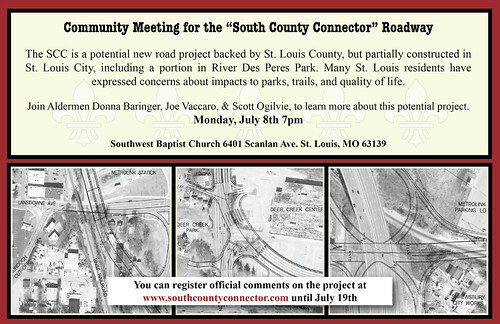 Next Monday evening, St. Louis Aldermen from the 16th, 23rd & 24th Wards are hosting an informational meeting about the proposed South County City Connector. the meeting will be held at Southwest Baptist Church, located at 6401 Scanlan Avenue in Lindenwood Park. As you likely have heard, St. Louis County Department of Highways & Traffic (they've made it clear they are not a bike department) is proposing a 6-7 lane limited access highway that would dump a significant amount of St. Louis County traffic onto River Des Peres Boulevard in St. Louis City. This will have negative impacts to the adjacent park, greenway bike trail and nearby residents.